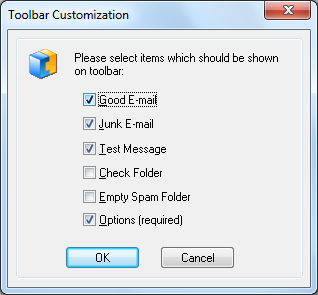 Spam Reader automatically adds its toolbar to standard Microsoft Outlook toolbars. Using Spam Reader toolbar buttons you can perform a number of program operations. You can add/remove the toolbar buttons using "Customize toolbar" command in Spam Reader menu. Spam Reader toolbar buttons have the following functionalities. Good E-Mail: The selected message will be used as an example of legitimate mai to update the database for Bayesian Filtering Algorithm. Spam Reader will also perform a number of operations customized by the user on General tab of program options. Junk E-Mail: The selected message will be used as an example of junk mail to update the database for Bayesian Filtering Algorithm. Spam Reader will also perform a number of operations customized by the user on General tab of program options. You can add/remove the toolbar buttons using "Customize toolbar" command in Spam Reader menu. In the displayed "Toolbar customization" dialog you can add/remove the toolbar buttons by marking the corresponding checkboxes.